For this exercise I am to imagine myself a publisher in Amsterdam in the middle of the seventeenth century, selecting a catalogue of prints to offer my regular clientele. I’m going to start with a grizzle. The pace of this course takes my breath away. It reminds me of trips some people I knew took between leaving high school and starting university – a coach tour of continental Europe (9 countries in 11 days) and a bit longer in England. The best you can hope for is a broad spatter, a couple of specific memories (hopefully more than just the Lion Pub in Rome) and an idea of where you’d like to explore “next time”. So “this time” I don’t feel able to go into the source of wealth of the merchant class of Amsterdam, or whether there was speculation in prints analogous to the speculation in tulip bulbs, or (having been to the Renaissance to Goya: prints and drawings from Spain exhibition at the NSW Art Gallery a couple of days ago) similarities and differences of the Dutch and Spanish “Golden Ages” of the 17th Century, or (based on the catalogue to the Goya exhibition) the impact of changes in paper-making materials and techniques. Grizzle aside, I did find a little information about my potential market at www.essentialvermeer.com/dutch-painters/dutch_art/ecnmcs_dtchart.html. Another resource suggested different proportions of popularity of subjects in 1645 to 1650: Biblical scenes 18%; Portraits 18.3%; Land- and seascapes 21%; Still lifes 11.7%; Scenes from daily life (genre)12.9%; Other 18.1% (Goosens, 2001). Based on this I have slightly adjusted proportions of works in my proposed catalogue. This is the first of my “biblical theme” prints. It shows Abraham dismissing Hagar, from the Book of Genesis. I feel that the general pleasant landscape and overgrown ruins will appeal to a wider audience in addition to religious buyers. Published by: Hendrik Hondius I. Print made by: Moyses van Wtenbrouck. 1620-1646 (published). 135 x 184 mm. The subject of my second biblical choice comes from the New Testament. It may be more familiar to my customers, and has a nice moral overtone. It is also an interior scene including opulent clothing and furnishings, which together with the detail of the dog front right should extend the print’s appeal. Published by: Alexandre Boudan. Print made by: Theodoor van Thulden. 1621-1669. 131 x 104 mm. This print is a slightly dangerous choice. It will appeal to some of my religious customers, although the subject’s involvement in a religious schism may cause difficulties. I am hoping that the print’s attractions as an interesting and detailed portrait by Rembrandt will appeal to buyers. The controversy was over some decades ago, so I believe the risk of causing disruption is low. Rembrandt van Rijn. 1635. 223 x 183 mm. This scene of the bark mill on the Omval, including a number of sailing vessels is the first of my landscape choices. It has the large sky and combines the water and land loved by many collectors. There is a good level of detail and accuracy in the rigging of the boats, a vital element for my customers. Print made by: Jan Vincentsz. van der Vinne. 1680-1700. 149 x 185 mm. This scene of a neat township, including a family walking to the church, is very appealing. It is a more enclosed scene, with a surprising amount of detail to capture the viewers’ interest. Published by: Clement de Jonghe. Print made by: Roelant Roghman. 1620-1630. 126 x 204 mm. This scene of productive countryside should attract many of my industrious customers. It combines with the town- and water-scapes above to provide a range of scenery options. This semi-indoors scene has a lot of detail to explore and a semi-comical feel. The bucolic / peasant content may appeal to some city-dwellers, either a reminder of their past or perhaps making them feel superior. There is also a sense of relaxation and comradeship, which may resonate with some of my customers. After: Adriaen van Ostade. Print made by: Johannes Visscher. 1670 (circa). 310 x 256 mm. This risqué scene will appeal to a portion of my clientele, but I will need to be careful of where it is displayed to avoid scandalising some customers. The bawdy print seen on the back wall increases both the interest and the risk. However I also see a certain earthy wholesomeness in the scene. After: Adriaen van Ostade. Print made by: Johannes Visscher. 1660 (circa). 335×267 mm. I have selected only one still-life for my catalogue. My countrymen are very fond of colourful bulbs. The great crash of the tulip trading is now in the past, and this print should not excite any negative reactions (possibly those most affected will not be buying prints!). After: Nicolas Guillaume Delafleur (engraving). Published by: Frederick de Wit. 1650-1706 (c.) 140 x 112 mm. For my final few prints I have decided to test the commercial waters with a few items outside the mainstream. This print shows the close engagement of two large fleets, with an English ship foundering in foreground. I think this will stir the patriotic and sea-faring amongst my customers. It is also larger than the other prints, so suitable to hang in different locations. Published by: Dancker Danckerts. 1666. 418 x 525 mm. This is another print that may offend some customers, so will stay under the counter until a likely buyer comes in. The print shows a satirical view of a Quakers meeting, the strident speaker unaware of various untoward goings-on in the background. Print made by: Carel Allard (also publisher). After: Egbert van Heemskerck. 1678-1679 (circa). 418 x 517 mm. A woman is seen from behind, having just bathed in the pond to her left. I have included this print simply for my own pleasure. I love the lines – the diagonal tree across the centre, creating a private space for the bather; the lines and curves of her body, her smoother curves contrasting with the more convoluted lines of the plants around her. There are very dark shadows contrasting with the very light sky, but an overall balance across the print. In the distance at the right there seems to be another figure, suggesting a more complex story. There’s something slightly knock-kneed or awkward about the woman’s stance, and oddly I rather like that too. Published by: Johann Day. Print made by: Moyses van Wtenbrouck. 1610-1647. 144 x 139 mm. Overall I feel this is a reasonable catalogue. I think there is a good variety in subject and sizes. There are a few inconsistencies – a wide range of publication dates, some subjects rather racy and views of Haarlem rather than Amsterdam (they look close on the map, but presumably in the 1600s were quite distinct – and many buyers would prefer their known, local scenes). I will “resolve” this by assuming that my shop is in a docks area on the fringe of Amsterdam and heading towards Haarlem. Many of my customers are labourers or dockmen, earthy and relaxed in their humour. Some may occasionally be in need of extra cash, and I am willing to buy older prints for resale at attractive prices. In this exercise I am to imagine myself made a cardinal in seventeenth century Rome, drawing up instructions for the artist/s for the renovation of my Roman palace – in particular the main reception room and my study. My new identity: I am Cardinal Nogliano. I come from Florence, the second son of a fairly wealthy and very ambitious family – merchants, or perhaps bankers. My older brother is continuing the family line, marrying well and growing the family business. After solid training by tutors as a boy, I attended the University of Pisa where I shared lodgings with Francesco Barberini. I am making my career in the Church and have been fortunate in this and other family connections to the Barberini family. Following Maffeo Barberini’s elevation to become Pope Urban VIII I was made a cardinal. After serving in a number of posts around Europe, including France and Portugal, I am now living in Rome. I have always been interested in the arts, play the lute and write poetry. I see myself as a man of science and have enjoyed an occasional correspondence with Galileo Galilei (although he had left the University of Pisa before my time there). Goals of renovation: This redecoration is one part of the ongoing strategy for the advancement in social rank of my family and myself. The main reception room in particular must express grandeur and extravagance, an ostentatious announcement of our achievement. The decoration should also make discreet but clear reference to my patrons and benefactors the Barberinis. This would express my gratitude, acknowledge my debt, and remind all who see it of my powerful friends. Also the artworks should enhance, support and celebrate the power and might of the Catholic church. My family achieved wealth and prominence fairly recently. References to the roots of ancient Rome would suggest we have ancient connections as a noble family. In the main reception room a theme of Aeneas, his journey and the founding of Rome would meet this need. It would act as a metaphor for the journey of the soul, and remind all who come of the triumph of the Church and papacy. The theme will be carried out in fresco on the ceiling and in a series of tapestries on the walls – a suitably aristocratic and expensive art, fit for my aspirations. My private study should, in addition to the goals above, be an expression of my personal qualities, history and interests. A series of allegorical paintings would achieve this. Commissioning the work: The actual commissioning of the redecoration can also play a part in extending and reinforcing the network of ties and obligations that I and my family continue to build. I want to use my Barberini connection, and also strengthen links to my family home in the selection of artists. For the purpose of this exercise I will assume I have already to some extent discussed my plans and the possibilities with Francesco Barberini – old friend, fellow cardinal and nephew of the Pope. However the social gap between us has become wider with the elevation of his family and while I welcome the obligation of receiving his views and want to pay the compliment of attending to his opinions, I do not judge it appropriate to involve him directly in the commissioning of the work. Francesco’s secretary Cassiano dal Pozzo has also been of enormous assistance with advice and suggestions of suitable artists. However I have decided to use the services of Michelangelo Buonarroti the Younger, the great-nephew of the artist Michelangelo and the childhood friend of Maffeo Barberini – Pope Urban VII. Michelangelo Buonarroti the Younger can act as an informal broker or agent between me and the artists, reinforcing my social status and adding another connection to the Pope (1). On many occasions you have shown me your benevolence, and I offer my most sincere thanks and am less wanting than obliged to serve you (2). Now that I am seeking to renovate my palazzo I find myself once more appealing to your generosity for assistance in finding out and engaging artists who can do honour to the position which has been granted to me. There are two rooms which now exercise my thoughts and test my judgement. The main reception room or Salone will be decorated with scenes from the life and travels of Aenaes, as told by Virgil in The Aeneid. The ceiling, to be painted by Pietro da Cortona should be covered in a fresco showing the ending of the wandering of Aeneas, a narrative thread including Jupiter reconciling the goddesses, Fate with the scales of Justice, the landing at the mouth of the Tiber and the battle with Turnus – a journey of the soul and the triumph of the Church and Pope (3). A series of tapestries must be worked in coloured wools and threads of silver and gold, showing scenes from the journey of Aeneas, to cover the walls of the Salone. The tapestries will be woven at the Barberini arazzoria, by kind permission and under the patronage of Sue Eminenza Cardinal Francesco Barberini. The main panels must be 16 feet high, with widths as indicted to fill the room. 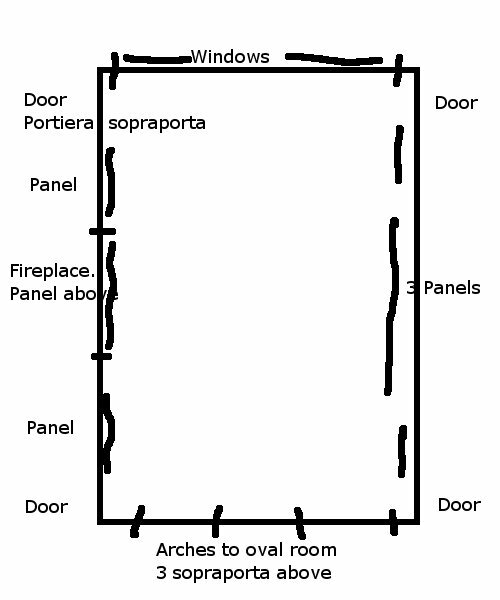 Four portiere will cover the doors, with sopraporte above (4). Three sopraporte will hang above the arches leading to the oval room. On each long side will be three panels, one large and two smaller. Each panel will include a border including olive branches and showing my family impresa, the blackbird (5). All scenes for the tapestries must be sketched in oil by Pietro da Cortona, then transposed into a cartoon by a suitable man such as Pietro Paolo Ubaldini, ready for the weavers. The designs must express our Christian values including piety, obedience to God, suffering, leadership. For my study I wish first of all for a Madonna and Child, with a tenderness between mother and child by one such as Artemisia Gentileschi who I know has spent much time in our city of Florence, is a some time Caravaggisti, and is well known to you (8) (9). Second I would have a portrait of myself, in the red bestowed on me by the grace of God and His servant, His Holiness Pope Urban. For the rest, I desire paintings to hang showing those muses who best express my own person and interests: Clio with her book and laurel, my interest in history and learning; Euterpe, garlanded with flowers and for my sake with lute instead of pipe; Erato, lover of poetry, the swan with feathers of black for the Nogliano bird (10); Urania, globe and compasses in hand, exploring the skies (11). For these I know you will be able to recommend to me artists of skill and stature, able to undertake such work in a suitable manner. I ask this favour of you, that you will find these artists and send to me their names and subject, when they can have this work completed and their fees. I thank you for your help and it will delight me if, just as from such a distance you find ways in which to serve me, you will also find ways for me to reciprocate by involving myself in things that bring your satisfaction. (4) The layout proposed is based on Garfinkle’s suggested installation of the History of Constantine tapestries in the Salone of Palazzo Barberini (Garfinkle, 1999). (7) An alternate to the story, avoiding the sexual liaison of Dido and Aeneas. (10) For this exercise I’ve adapted the Nolan name and heraldry, the martlet becoming a blackbird. Here I’m trying to add the extra twist of a reference to the as yet unknown black swans of Australia. Cole, J (2007) ‘Cultural Clientelism and Brokerage Networks in Early Modern Florence and Rome: New Correspondence between the Barberini and Michelangelo Buonarroti the Younger’, Renaissance Quarterly, 60, 3, pp. 729-788, Academic Search Alumni Edition, EBSCOhost, viewed 14 September 2013. Hall, J. (2008) Dictionary of subjects and symbols in art. (Second Edition). Boulder: Westview Press. 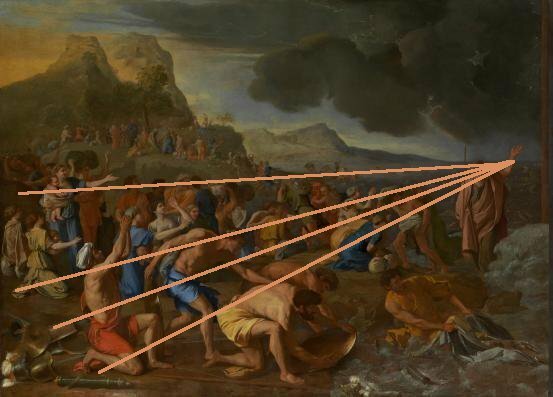 The first part of this exercise was posted 7-Sept-2013 and was an annotation of The Crossing of the Red Sea by Nicholas Poussin. The subject of the second annotation is Two old men disputing (1628) by Harmenszoon van Rijn Rembrandt, held in the collection of the National Gallery of Victoria (NGV). This picture is beautiful – luscious and rich, warm and enveloping. Two men sit in a study, surrounded by all the paraphernalia of learning. They are deep in conversation, intent on a passage in the book held on the lap of one. A shaft of light from a high, unseen window falls between them, illuminating their discussion and casting the rest of the room into relative shade. One man dominates the painting. He sits in the larger chair – apparently at his desk in his study, speaking to a visitor. His face is lit as he leans forward, making his argument. His body is expansive, filling the centre of the room, one side brilliantly lit the other side, in the centre of the painting, virtually the darkest area of all. His face is lined and his eyes rheumy, but still intent and focused. There are still some flecks of brown in his white beard, still some vigour left. There is a clutter of books in bags, on a stand, almost falling off a stack on the floor. A shape which may be a globe looms behind. 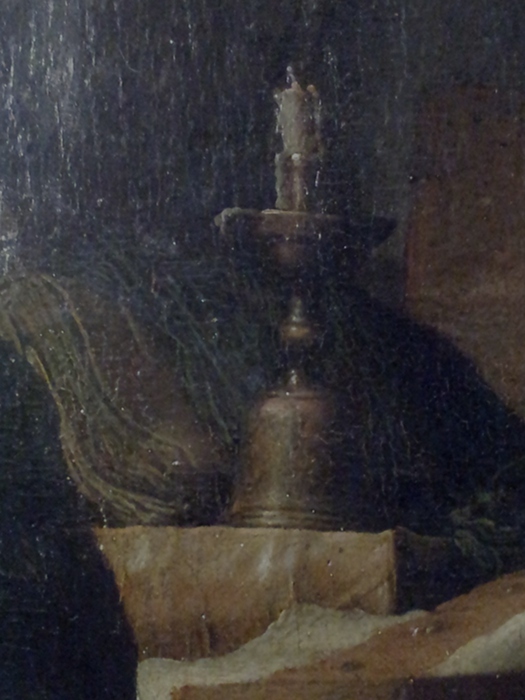 A half-burnt candle with wax running down can be seen, sitting on yet another book, suggesting the occupant studies late into the night. This is what matters in his life, the world of thought and ideas. 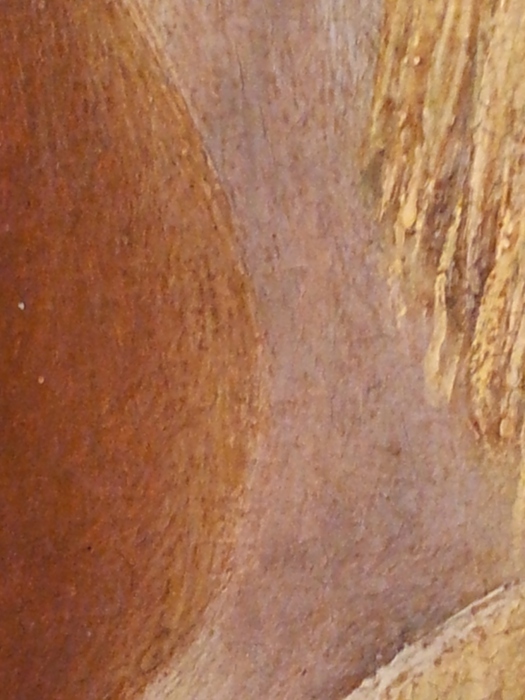 The man in brown, his back to the viewer, appears to be a visitor – is he wearing a travelling cloak? He sits on a lower stool, below the chair of authority, and listens. His feet are bare. Is he a supplicant or a disciple of the scholar he is visiting? A quill is laid beside the ink pot – perhaps he interrupted the owner busy making notes. I don’t get a sense of a dispute, more a debate, an exchange, an exploration. Above I described the painting as “luscious and rich”, but in some ways it is austere. It shows an intellectually rich life but there is no overt wealth – the room and furniture look a little shabby. They are of no consequence. Much of the richness comes from the textiles which cover a large portion of the picture – the fringed brocade cloth draping across the desk, and their clothing, the possibly wool robes simple but warm and well-kept. The palette is also rich but limited – mostly golden yellows and browns, with some touches of pink and neutrals. It’s the light which captures me in this work. It could have a metaphorical intent – knowledge bringing light, or a religious message – but it’s the physical light that warms and attracts. It is reflected everywhere, shaping and defining the room and its occupants. 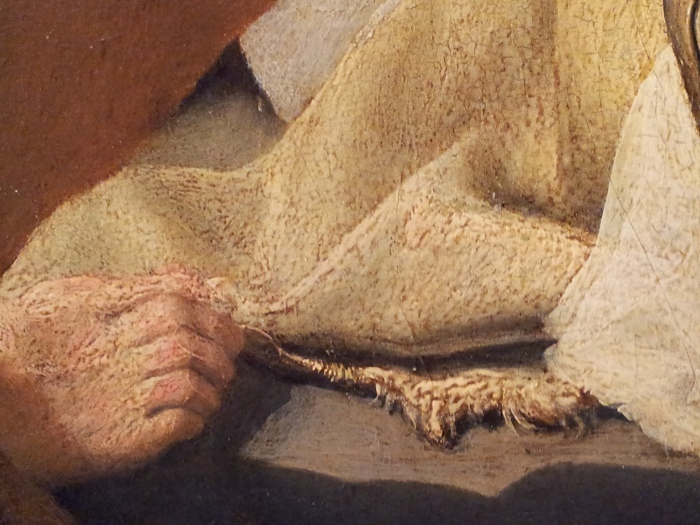 The corner of the visitor’s robes, its border made up of small individual brushstrokes rather than lines or smooth shading, is lightened and brightened by the light reflected by the table drape. Zooming in still more (if you click on the thumbnail to the left) you can see the myriad colours, yellows and pinks, flecks that bring texture and depth to the picture. Where the brocade cloth spills onto the floor there is reflected light shaping the deep folds, an extra touch of comfort. You can see the highlights and shadows (but not dark shadows, no lost detail) of the scholar’s face above. The glints in the eyes enliven the whole face, bringing personality and that sense of piercing intellect. It is interesting that in a painting so full of light the centre is such heavy, dark shadow. I found my eyes circling around it, unable to piece it, and enjoying the contrasting detail and warmth around it. Some sense of depth to the room is suggested by the shadows behind the globe (if that’s what it is), but the focus remains at the front of the picture plane in a fairly shallow area containing the two men and the desk, centered around that shaft of light connecting the two scholars. Although there is a lot of texture in the picture, including the background stucco (?) wall, the old wood on the left and all those textiles, there seemed to me an overall uniformity in the paint strokes in the foreground and highlighted areas and in the background. This work was painted in Rembrandt’s early Leiden period, when he was about 22 years old. Hanging next to it at NGV was another Rembrandt from near the end of his life – Portrait of a white-haired man (1667), see www.ngv.vic.gov.au/col/work/4290. I didn’t spend much time with this work, just enough to notice the difference in the brushwork – so varied and fluid and uneven, none of that sense of painstaking precision. Although so different both seem to me to have a sense of assurance, of purpose. Two old men disputing was bought around 1934-36 for the NGV. The actual purchase was by the Felton Bequest – a massive bequest from merchant Alfred Felton in 1904 (Mangan, 2004). There is an independent Committee managing the bequest, interacting with the Council of Trustees of NGV. This arrangement became very difficult when the Rembrandt, previously thought lost, appeared in Amsterdam having been in a private family collection in England. Bernard Hall, then acting as London adviser to the Felton Bequests Committee and a former NGV director, made the discovery and urgently recommended purchase. A long and frustrating process followed, the Council of Trustees keen and the Bequests Committee dubious about the painting’s authenticity (Perkin, 2006). Obviously in this case the concerns were allayed, the painting was purchased and the attribution appears to be sound. However on the same wall of the gallery, alongside Two old men disputing and Portrait of a white-haired man is a third painting – Rembrandt (1660s), purchased by the Felton Bequest in 1933. It was then thought to be a self-portrait by Rembrandt. The NGV online collection listing today shows artist/s name REMBRANDT Harmensz. van Rijn, REMBRANDT Harmensz. van Rijn (studio of) (http://www.ngv.vic.gov.au/col/work/3731). The painting hung on the gallery walls for fifty years, a star attraction, before the attribution was revised in 1984 to “Unknown”, and subsequently revised again to “studio of” ((Maslen, 2006) and National Gallery of Victoria (2007)). The NGV website doesn’t seem to have a photo of Rembrandt, but I found a couple in other sources (linked below) which show an interesting contrast in the authors’ responses to the work as a fake. The first is at http://www.crikey.com.au/2007/08/06/melbournes-other-big-fake-wasnt-a-rembrandt/. Here W H Chong wrote “I’ve always thought it was a very good piece, and if it was by another hand it means that the other painter had very good eyes and hand, too” (Chong, 2011). Chong has done his own sketch from the work as a way of exploring its structure and leading on to comments about the nature of portraits. In contrast at http://vuir.vu.edu.au/21477/1/Mark_Boyle.pdf Boyle used photography and photo-manipulation to investigate well known paintings and perceived value, with one conclusion being “Our perceptions of art are very strongly influenced by our knowledge of the status of the artist who created the work” (Boyle, 2012. p. 2). Boyle “reverently admired” the Rembrandt in the 1970s and 80s. Revisiting the work with the knowledge that it was not painted by Rembrandt, Boyle identified “an anatomical impossibility” (Boyle, 2012. p. 33) and poor draughtsmanship (Boyle, 2012. p. 13). My own experience of “what’s in a name” came while studying Two old men disputing. A woman walking through called her child over to look at “this one by a really famous painter” – pointing at the only work hanging on the wall which wasn’t a Rembrandt. Having already read the label I felt slightly superior in my better information – a reaction rather unattractive and nonsensical, but not I think unique. I’ve been musing since on whether knowing the artist should make a difference to my response to a work. * Clearly there’s a difference in financial terms. Estimates for the “Rembrandt” fell from $3 million to less than $54,000 (Maslan, 2006). * We may be unduly influenced by the perceived status of the artist, as described by (Boyle, 2012). On the other hand it seems a good idea to try to approach each work on its own merits – after all, not every item produced by a master is a masterpiece. * We can have a sense of history, a sense of connection to another, when looking at a work. When I was able to see and touch the Book of Hours (posted 17-July-2013) I was thinking of the person who may first have used it, rather than the artist(s) or artisan(s) that created it, but it’s still that feeling of a link to another person, another time. * I want to look at work which is an authentic expression of a person’s creativity, part of their artistic exploration, and certainly not falling off the end of a cynical and deceptive production line (this thinking of forgeries rather than mis-attributions). I don’t know how that fits with the Book of Hours, or the Italian plate (posted 28-July-2013), or any work created because a person wanted to eat as much as or more than they wanted to express their inner thoughts. * As I learn more it becomes really interesting to look at a work in context – what was happening in the world around at that time, influences on the artist, work they did before and after. All that becomes meaningless if a work isn’t what it purports to be. 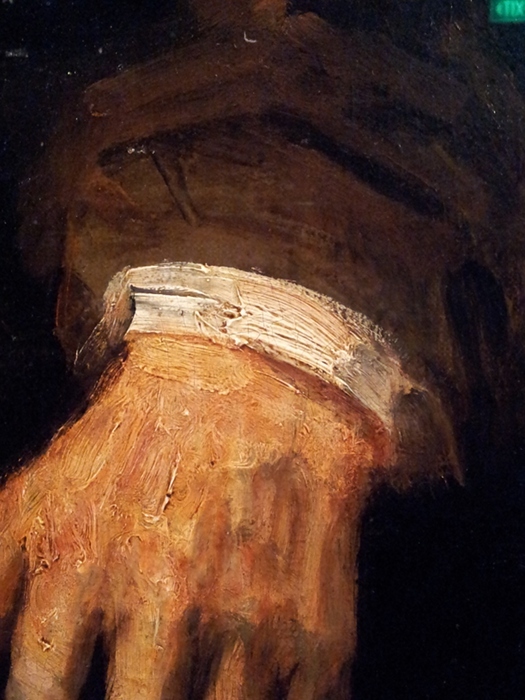 * Attributions can change, and change again, as seen with the “Rembrandt”. Both Art Historical knowledge and the technology available continue to develop. Another revised attribution at NGV is a work previously thought to be by van Gogh, and a report by the Van Gogh Museum and the NGV response is available at http://www.theage.com.au/ed_docs/ngv.pdf. The museum’s art historical investigation included literature, provenance, the identity of the sitter and style of the painting including comparison to known works of van Gogh. The technical examination used light microscopy, x-radiograph, analysis of thread and paint samples and more. The NGV’s response, at the same link, is worth reading. I’m sure I’ll learn and think more on this, but the immediate conclusion is that I am very happy that NGV has continued to display both the “Rembrandt” and the “van Gogh”. It hasn’t quite fit into this particular post but I want to mention one other resource I found while researching Two old men disputing – Articulating Desire by Leonie Watson. Watson’s discussion on the depiction and use of light in Two old men disputing is detailed and rather different to mine, especially where she finds a “central brightness” and definitely not a “central dark void” (Watson, 2012, p. 30), while I was disturbed by my eye circling around a central deep shadow. In addition to light Watson discusses the use of drapery and folds in artworks. She doesn’t discuss the Rembrandt specifically in this context, and I found her discussion beyond my current grasp. I hope to return to it another time. This exercise comprises two annotations – one a work by Bernini, Caravaggio or Poussin, the second a painting by an artist from the Low Countries. I have chosen The Crossing of the Red Sea (1632-34) by Poussin and Two old men disputing (1628) by Rembrandt. Once again my choice was driven by availability and my strong desire to see in person the works I study. 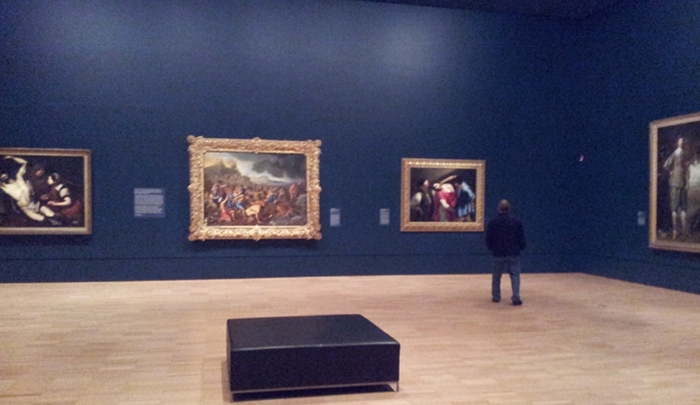 Both paintings are held at the National Gallery of Victoria. In this post I will focus on the work by Poussin. 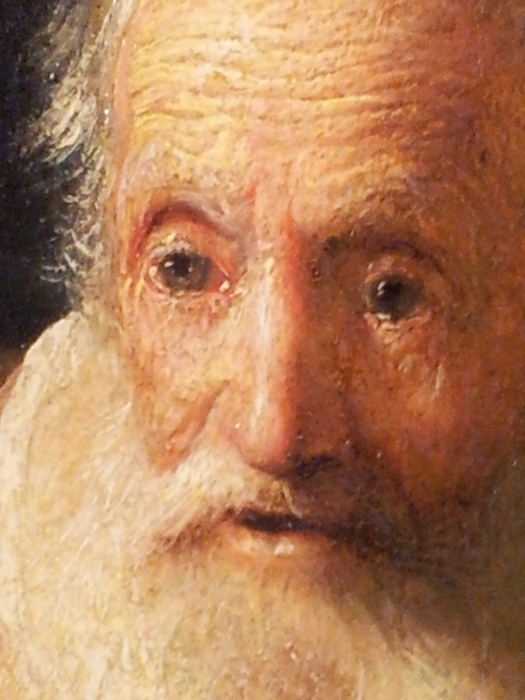 A later post will consider the Rembrandt. I also need to compare and contrast the two annotations. The painting shows a biblical scene from Exodus. Called by his God, Moses led the Israelites from slavery in Egypt. When the Eyptians gave chase, God parted the waters of the Red Sea giving the Israelites a dry path. In the painting the Israelites have reached dry land. Guided by God, Moses has stretched out his hand and the waters have flowed back, overwhelming the chariots and horsemen of the Pharaoh’s army. Horses can still be seen struggling in the rush of the water. Some of the Israelites have turned to give thanks and praise for their deliverance. Others are salvaging weapons and arms. More have walked on, continuing the journey to their promised land. The painting has recently had extensive conservation work and the light, bright colours in the image correspond fairly well to the actual painting (on my screen at least), although the full spread of values and crispness and detail of the original have been lost. My first impressions when seeing it was that it is very large – 155.6 x 215.3 cm. My second was that I couldn’t make sense of it. I couldn’t work out what to look at, it was all a confused jumble my eyes roamed around without any path or guidance. Taking the photo of the gallery I was standing in a large doorway with Nicolas Régnier’s Hero and Leander (see 22-July-2103), so human and personal in scale and emotion, just behind me. In front of me, the Crossing. I stood back, I stood close, I sat mid-way. I couldn’t connect. A few people came by and we chatted about where we were visiting from or Charlton Heston or the amazing frame. I tried to find lines in the composition, but wasn’t convinced. It just eluded me. There are no buildings to be seen, only a jumbled sea, people milling in confusion, and a vast distance of land behind. Small clusters have formed in the throng. They give thanks, or comfort each other, or gather salvage, or trudge on. Moses stands quite apart from the people he is leading, looking back. It was only on my second visit, having done some reading overnight, that I saw the red column at the very edge on the right – the pillar of fire that was the visible form of God guiding the Israelites. Not the shadow of the frame after all! 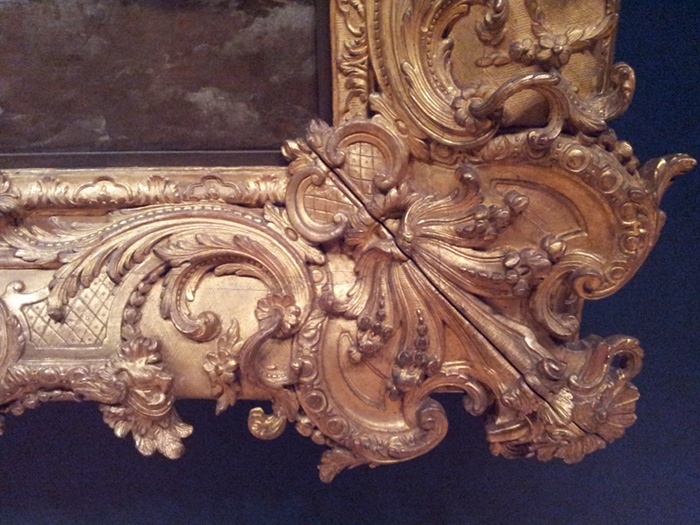 In fact possibly the elaborate frame was itself a distraction from the intended flow for the eye. The figure of Moses together with the column of fire would seem to be the focus of the painting – strange when they are so far to one side, isolated, and Moses smaller than other figures in the painting. There is also that pull of the vast land, and the mountains and dawn light in the sky in the left. 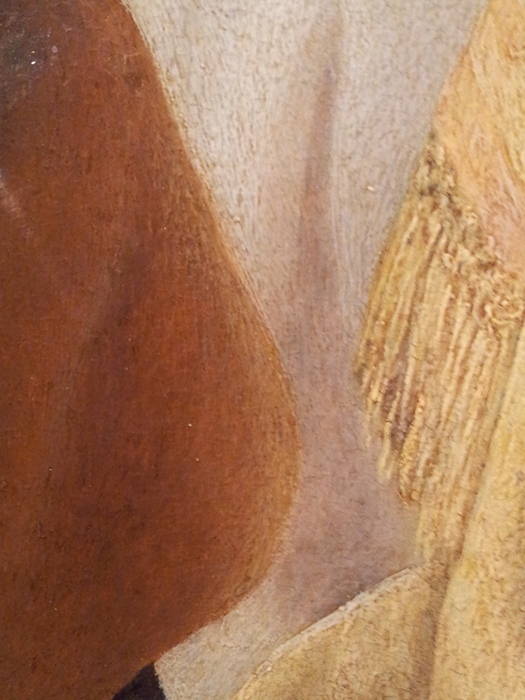 There are clearly different levels of finish for major figures in the painting. Places in the sky seemed almost bare, although it wasn’t possible to see closely. This painting and its pendant (the other of a pair of paintings) The Adoration of the Golden Calf were commissioned for Amedeo dal Pozzo, Marchese di Voghera from Turin, by Cassiano dal Pozzo in 1632. They were completed by Poussin in 1634. Cassiano worked as secretary for Cardinal Francesco Barberini, one of the powerful Barberini family. From the dal Pozzo family the two paintings passed though a number of collections in France and eventually in 1741 were sold to Sir Jacob Bouverie in England. In 1945 the Adoration was sold to the National Gallery in London and in 1948 the Crossing was sold to the National Gallery of Victoria (Benson, 2012). Interestingly this history, so neat and clear, was less clear fairly recently. In 1971 Helsdingen reviewed then-current theories placing the painting of the Crossing later than the Calf, perhaps 1637-38. Based on his analysis of composition, motifs and stylistic differences, Helsdingen suggested the Crossing was the earlier work, perhaps 1633 (Helsdingen, 1971). Benson cites a paper published in 2000 (Cifani and Monetti, 2000) which established payments by installments for the two paintings from 1632, recorded in banking details. The Crossing of the Red Sea underwent a major restoration in 2011, documented in an online conservation treatment diary at www.ngv.vic.gov.au/explore/conservation/the-poussin-project and the book Poussin: the Crossing of the Red Sea: a conservation project (Villis, 2012). Both sources expose some of the difficult and delicate choices that must be made in a conservation project. If you follow the link above to the project diary, there is a part describing where what had appeared as a face and is now returned to being the back of a head – all part of a balance between “fidelity to the image, the artist’s hand and the physical history of the picture” (Villis, 2012 p. 25). More to the point for my current study, it was recognised that there had been darkening of colours and tones. In particular changes in middle tones could cause increased contrasts in the image, causing some elements to appear isolated, other areas flat, and space indeterminate (Villis, 2012, p.13). Research carried out as part of the conservation project included examination of a well-preserved replica from the 1680s, once presumed lost. This valuable resource allowed understanding of “the full harmonies of Poussin’s carefully arranged tones and colours, along with his integration of figures into the landscape” (Villis, 2012 p. 24). However in maintaining that fine conservation balance, intervention in the original was limited to a carefully judged minimum. Writing about the outcomes of the conservation, Benson observed that it had revealed Poussin’s manipulation of light – “a discernible sense of unity between land, sea and sky has returned, making it far more visually coherent and appealing”. Perhaps, given my current state of development and understanding, some of those changes over time that are still in place contributed to my difficulties in reading the painting. Helsingen’s work was published decades before the recent conservation. Despite this, and despite subsequent scholarship overturning some of his conclusions, I found Helsingen’s analysis of the Crossings composition rather comforting given my own struggle. He saw “…virtually no attempt … to co-ordinate large groups of figures” which remained isolated rather than linked. Helsingen believed “Poussin has failed to achieve a coherence”, “the attitudes of the figures and the fall of the drapery display an ambivalence and lack of consistency” and “the indistinctness of many figures is such that the observer is unable to acquire an insight into the spatial relationships between the figures and the groups” (Helsingen, 1971, pp. 66-67). Helsingen did mention a zigzag line suggesting depth, which I have traced out on this version. It’s not a complete answer – there is a horizontal frieze-like band of figures across the centre which isn’t included. On the other hand that sense of depth is supported by changes in saturation and value. I would say the sense of enormous space is one of the undeniable successes of the painting. Another helpful approach was suggested to me by work at http://sheilaraven.blogspot.com.au/2010/05/ideas-from-other-paintings-1.html. It was only after I created this version of the image that I realised that this link was to another OCA student’s learning log! It certainly appears that diagonals and the use of golden sections helps in organizing the placement of major figures and that central frieze. However I feel that there is more than geometry or changes in appearance underlying the difficulty of the composition. A paragraph in a 1994 exhibition review by Robert Hughes had me scratching my head (Hughes, 1994). Hughes was reviewing a retrospective of Nicolas Poussin at the Grand Palais in Paris (I am fairly sure the Crossing was not included, presumably because of its fragile state). Referring to The Destruction of the Temple of Jerusalem Hughes wrote “With its structure of color, bound by a repeated accent of red, with its perspective lines, its golden-section ratios, its echoes and reversals of pose and gesture, and the contrast of the milling crowd of figures with the stately columns of the temple, it is an incredibly complicated pictorial machine.” Most of this sounds applicable to my focus work – but further description just didn’t jell with the image I found on the internet. Eventually I discovered two pictures on this theme by Poussin – The Destruction and Sack of the Temple of Jerusalem (1625–26) in the collection of the Israel Museum, Jerusalem (http://www.imj.org.il/imagine/collections/item.asp?itemNum=199789), the second Zerstörung des Tempels in Jerusalem durch Titus (1638/1639) in Kunsthistorisches Museum Vienna (http://bilddatenbank.khm.at/viewArtefact?id=1477). Both are crowded battle scenes. The earlier one has more information in a sense – the flames on the roof of the temple can be seen, while in the later version major figures are looking out of the picture frame. However the space and detail in the foreground of the later version gives a more horrible concreteness to the conflict. The dates of the two works straddle that of The Crossing of the Red Sea. 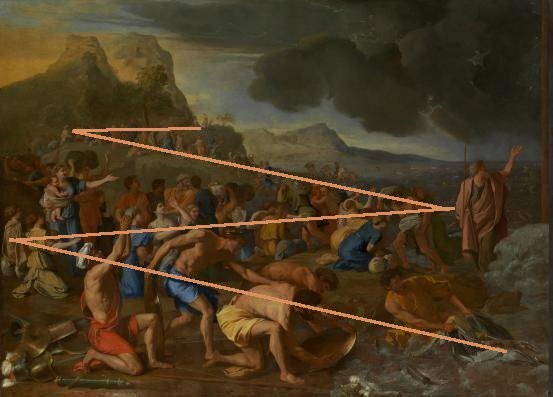 In my eyes elements of each Jerusalem can be seen in Poussin’s handling of the Crossing. It could be that this chronology suggests a progression in Poussin’s handling of large crowd scenes. Alternatively, Poussin may have chosen the milling confusion of the Crossing in “simple” reflection of the milling confusion of a crowd at a highly dramatic moment. The Crossing of the Red Sea, together with The Adoration of the Golden Calf and other paintings illustrating the life of Moses commissioned from other artists at the same time, presumably met the requirements of Amedeo dal Pozzo on whose behalf the work was commissioned from Poussin. It is large, imposing and grand. Together with its subject and content this would demonstrate the learning, devotion and wealth of its owner. The documentation of the recent conservation effort demonstrates that the painting on view is the best possible presentation to a modern viewer, although it cannot be entirely the visual experience first produced by Poussin. As one of those modern viewers, earnest but not learned, I have clearly struggled to understand and appreciate this painting. It is not immediately engaging or giving. Imposing, grand and scholarly does not equate to approachable or warm. I did not easily see the drama of the moment. The different reactions of the participants, their confusion, wonder, thankfulness and stoicism, the scale of the historical incident, became a visual confusion for me. However I feel that the painting may reward the effort needed to appreciate it. With reading and thinking in the time since my visit, perhaps I understand a little more of the intention and the presentation of the painting. Unfortunately I think that to get further I would need to see the painting again in person. I hope that is feasible some time in the future. Benson, L. (2012) A Brief History of The Crossing of the Red Sea In: Villis, C. et al Poussin: the Crossing of the Red Sea: a conservation project Melbourne: The Council of Trustees of the National Gallery of Victoria. pp. 1-5. Cifani, A. and Monetti, F. (2000) The dating of Amedeo dal Pozzo’s paintings by Poussin, Pietro da Cortona and Romanilli. Burlington Magazine 142, September 2000, pp. 561-64. Cited in Benson, L. (2012) A Brief History of The Crossing of the Red Sea In: Vissis, C. Poussin: the Crossing of the Red Sea: a conservation project Melbourne: The Council of Trustees of the National Gallery of Victoria, p. 35. Hughes, R. (1994) ‘Decorum and fury’, Time, 144(23), p. 86, Academic Search Alumni Edition, EBSCOhost, viewed 7 September 2013. 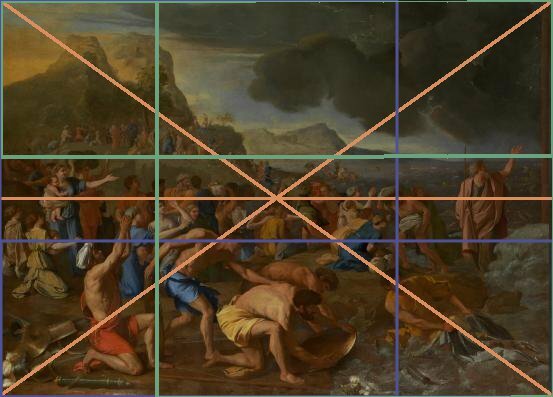 Villis, C. et al (2012) Poussin: the Crossing of the Red Sea: a conservation project Melbourne: The Council of Trustees of the National Gallery of Victoria.